Promising Talent, this Norman Rockwell painting, appeared on the cover of American Boy published June 1917. An alternate title for this painting is Boys Singing and Playing Harmonica. 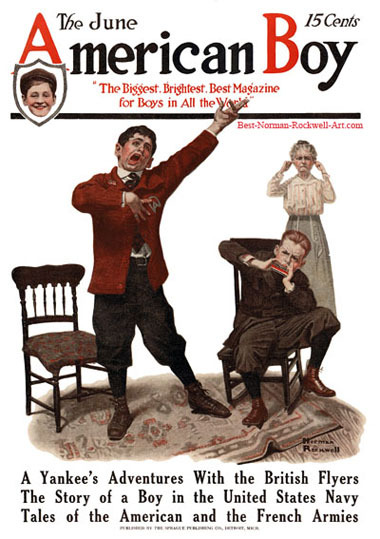 This was the second picture by Rockwell to appear on the American Boy cover. American Boy only published five Rockwell covers, between 1916 and 1920. Here we see Rockwell at his best, painting boys having good-natured fun. These two boys are enjoying making music together. They are enjoying honing their talents as a musical team. They are also annoying their mother. The singer is making a great show with his hand and face. Reaching for the sky must help him hit those higher notes. Or so he believes anyway. The harmonica player is sitting in a rocking chair. In addition to playing the harmonica, he is keeping time as the rhythm section by stomping his feet. He has rocked the rug across the floor. The mother is standing in the background. She has poked a finger in each ear. She is not really enjoying the music. We do not know whether she just doesn't like music or if they are really that bad. At least she cares enough about their feelings to just stand there in the background.